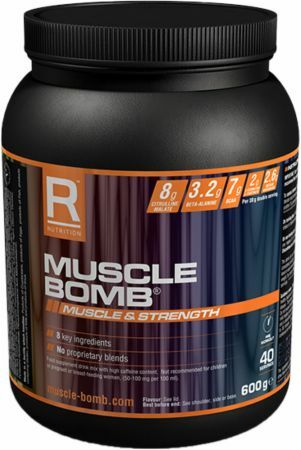 Muscle Bomb by Reflex Nutrition at Bodybuilding.com - Best Prices on Muscle Bomb! Love this product. It gives a great pump, tastes great and has very good ingredients. Of course it is not comparable to Stimboosters like Jack3D etc but this is why I like it so much. It does not harm your health and you get good energy and alertness and pump, the motivation you have to have yourself. And 250mg Caffeine per double serving is the perfect amount for me. Plus I don't have to swallow down this disgusting pure Bcaa powder before my workout which is only a luxury thing but still nice. I have used this product for 3 weeks and i would like to recommend this product as a pre-workout supplement to buy because its effect is so amazing so i can't stop train harder and harder every time i drink it before workout. I have tried virtually all of the popular pre workout supplements, including Pre Jym which was my favourite pre workout product. I have to say that after trying Muscle Bomb by Reflex, this product surpasses any other pre workout formula I have ever tried. Every ingredient is included in the full doses determined by scientific research to be effective at enhancing performance. The flavour is not so bad, it can become a little 'fizzy' so to speak if shaken vigorously, therefore a couple of gentle shakes is all is required. This product is fantastic and I doubt I will go back to using any other pre workout product after this.